Welcome to the capital of Spain, the most populated city. It houses the headquarters and government agencies as well as the official residence of the King and the president. Cultural center with museums of international reference like "El Prado". Other must-sees are the Royal Palace, Plaza Mayor, Buen Retiro Park, Puerta de Alcalá, Puerta del Sol, Cibeles Fountain, Santiago Bernabeu´s stadium, the Trail, etc. 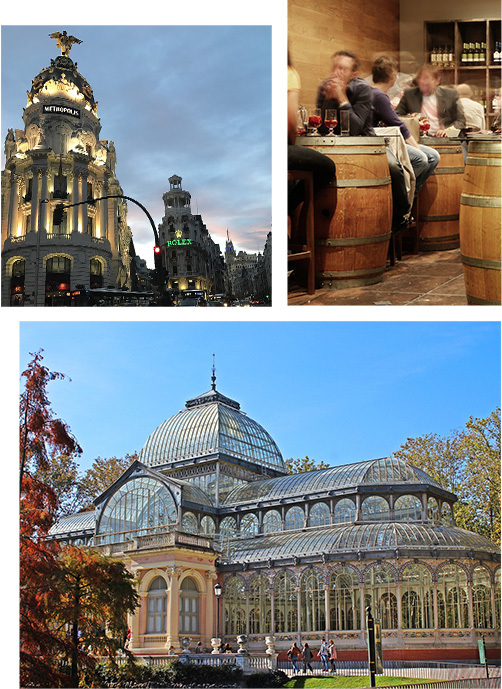 Discover Madrid and mix with its open, happy and welcoming people. Lose yourself in its streets, discover its bars, its shops and live the night. Gastronomic pack (Know their restaurants, wines and their tapas) Delicious!